These are the 3 newest postings to Bob’s website – be it new essays, stories, songs, videos, books or pottery. Enjoy! In spite of the full plane I was even more delighted to see that the seat beside me was empty. It stayed empty until the very last minute when a little old lady (that is to say someone of my age) shuffles in beside me. I realize that I am looking into the eyes of Joni Mitchell. This is the person who will be my seat mate for the next four hours unless I do something to piss her off and get thrown into the back of the plane for the rest of the trip. This is going to be epic or tragic, I feel, depending on my next move. Most of these stories have been a product of serendipitous encounters with various musicians or a bit of a by product of some freelancing, but since moving to Calgary I have also had the opportunity to actually buy an encounter with some fantastic musicians. Sounds sleazy, but relax; the money part was just basically a tuition fee for some amazing workshop experiences. Coming soon a listing of upcoming events in Bob’s World – speaking engagements, music and other importaint dates. Our newsletter is only use to keep you informed of various activies that Bob is involved with. Your information will never be sold or given to anyone else. 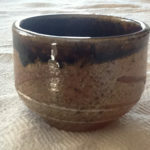 To encourage new subscribers to the Newsletter, we will make a draw every month from that months new list for a handcrafted, by Bob, Canada 150 tea bowl (not always as illustrated). Thank you so much for your interest and support!